This is what happened a few of days ago when we went to the Temple of Heaven with E.’s colleague and his family. It was a beautiful day, and we had a great time. We had been wearing our masks until we met them and decided to be polite and not look like freaks and spent the day happily breathing in micro particles that settled in our lungs and will never come out. The masks are not the flimsy paper ones I sometimes wore on scooter rides in India. To be efficient, they need to have a plastic seal to “glue” the thing on your face (goodbye make up!) and a valve to let the air in and out. It’s uncomfortable and you look like a paranoid mutant. We also bought little devices that I call “nose tampons” that you stick inside your nostrils to filter the darn particles. That means you have to breathe exclusively through your nose. The ones I bought are too small and I am not sure I trust them enough to buy the bigger size. That night, back in our new apartment, I told E. I had a tickle in my throat and wondered if I was getting a cold. Fortunately, or unfortunately depending on your view, that tickle is still there, with now a scratchy throat added to the mix. The good news is that I am not getting a cold (good since I don’t want to spend my vacation miserable), but I am experiencing the effects of pollution and allergies. I have been here a week only. We bought a couple of air purifiers for the apartment that should be delivered today. The mega kind. Not the wussy machines that swallow pet dander like we have in the US. Those catch over 99% of those nasty deadly particles. Because it’s not enough that the pollution exists outside, it creeps inside your homes as well. I don’t know how. Maybe it comes in through the air conditioning units, and through small gaps in the windows. So if you think that staying home will protect you against the ill effects of pollution, you’re only partially right. We like Biejing a lot. But the pollution is the reason why in 6 months, we are moving south to Shanghai. Aside | This entry was posted in Casual observations and tagged air purifier, allergies, Beijing, China, expat, mask, pollution. Bookmark the permalink. Nose tampons – that is exactly what I thought when I saw those things. Not a huge amount better here in Shanghai! 137 on this fine fall day. In the double digits only yesterday, yipee! 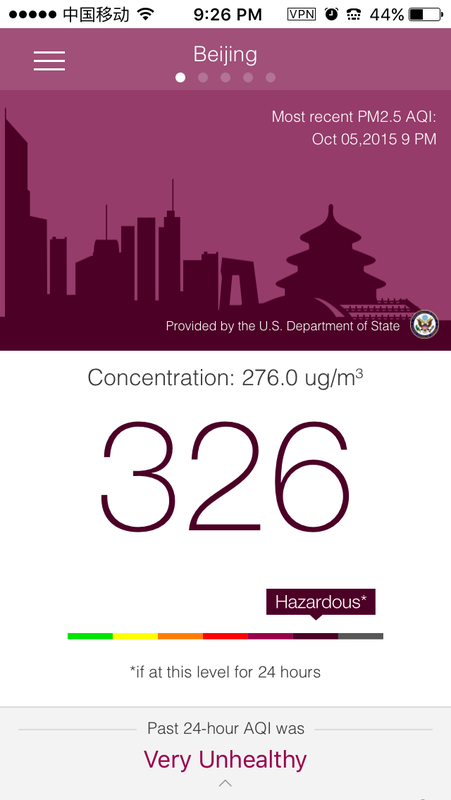 But overall Shanghai is a healthier city.